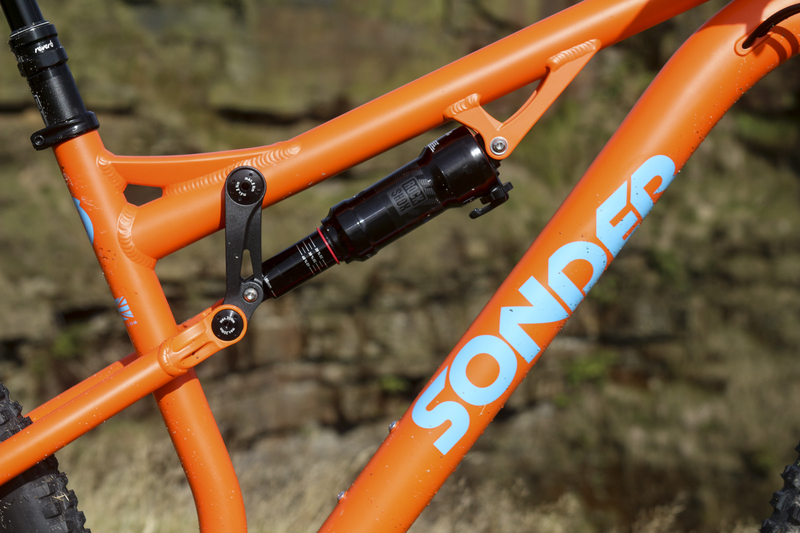 Just yesterday, we brought you the news that Sonder has unveiled it’s first ever full suspension bike. It’s called the Evol (‘Love’ backwards, actually), but don’t worry – Sonder has made sure it can use that name, even if you have seen it *cough Fox *cough* elsewhere. The Evol has been under development for the past 18 months, with the original design having gone through two revisions. You may remember seeing our news article about one of the prototypes that was nicked back in May – looks familiar huh? Well, things have progressed since then, and Sonder is now ready to bring it’s 140mm travel trail bike to market. While not officially available just yet, the new Evol is due to arrive by late November. So consider this your entrée for the main event. 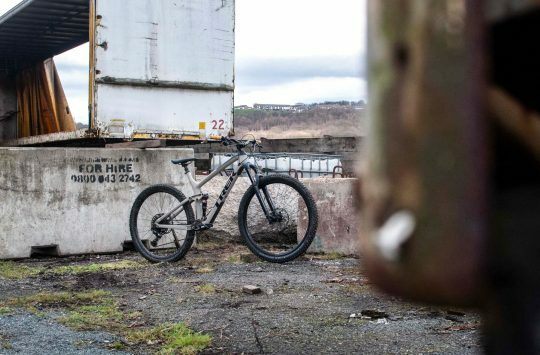 Like all of Sonder’s bikes, the Evol will be available to purchase directly through the Alpkit website, after which it will be shipped straight to your door in a large cardboard bike box, with only the handlebar and your pedals required to fit before it’s ready to ride. 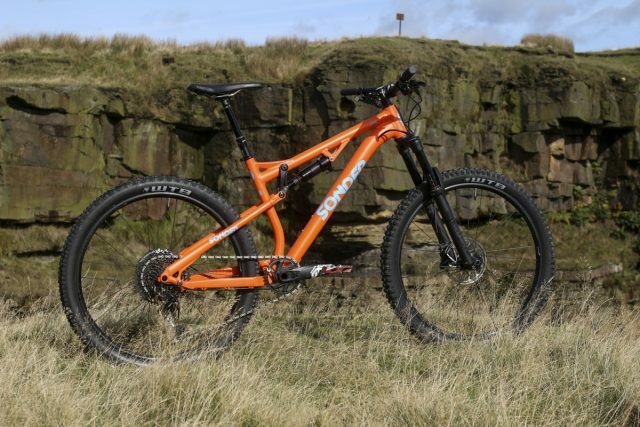 And as with Sonder’s Transmitter and Transmitter Carbon hardtails, the Evol will be available to purchase as a frame on its own for an unbelievable £899 (with the RockShox Deluxe RT shock! ), and as a complete bike with several build kits available. Neil from Sonder informed us that the build kits will be very similar to those found on the Transmitter Carbon, which means there’ll be five build kits on offer, starting at £1599 for the NX1/Recon build (pricing to be confirmed), and going all the way up to the all-bling XX1 Eagle/Pike build. 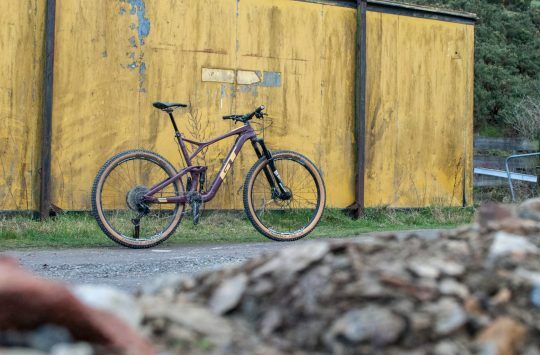 On top of those five stock build kits, there will be further options to customise the spec, with the ability to upgrade to carbon wheels (Love Mud Hullabaloo), alter the fit of certain components such as stem length, bar width and dropper post travel, or even change things out like the saddle or the tyres. 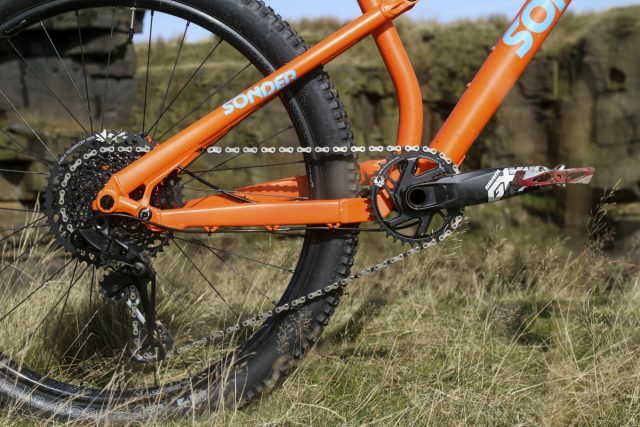 Basically, you tell Neil and the crew from Sonder what you want, and chances are they’ll be able to accommodate most requirements before your bike is built. 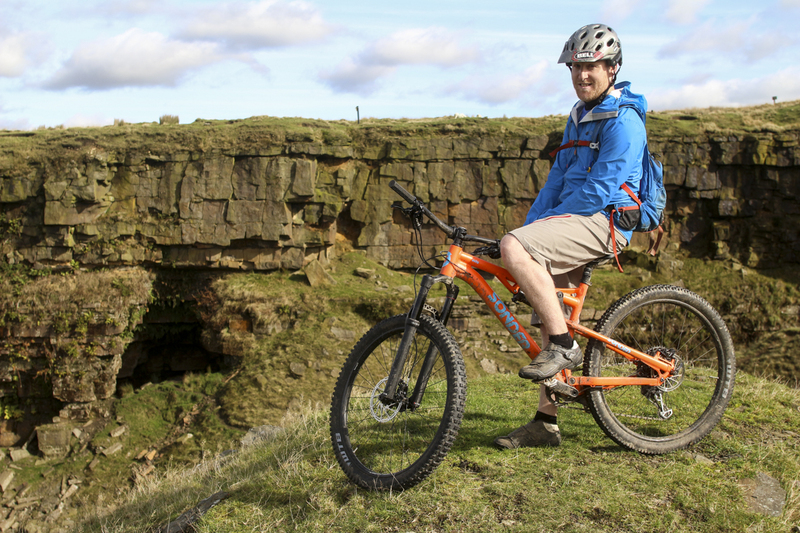 Neil from Sonder Bikes, with his latest creation; the Evol. 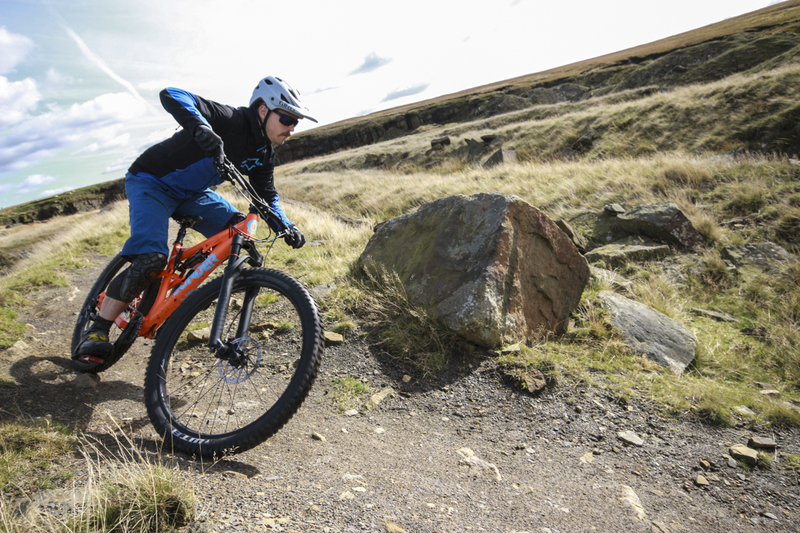 We were fortunate to be paid a special visit by Neil (Sonder’s lead designer, bike tester, ginger shredder, and all-round good dude) during the week, where he brought the very first Evol for us to check out and put to the test on some of our local trails. The bike I got to ride features a SRAM GX Eagle build kit with a RockShox Revelation fork and Love Mud Hobo wheels. It’s expected to retail for £2299, which puts it in a very advantageous position price-wise within the current trail bike market. The Evol is a 140mm travel trail bike that’s built with a tough alloy frame and a four-bar suspension design. 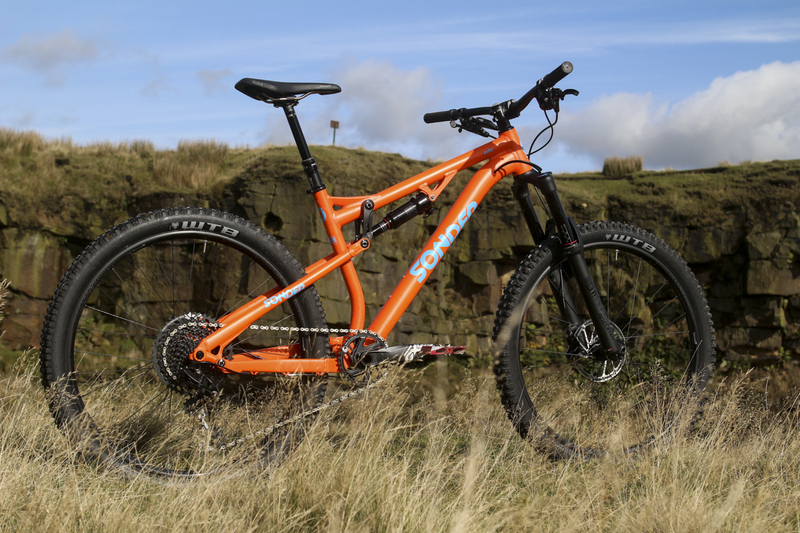 There will be five different build kits available with the Evol, as well as four frame sizes and three colours. I won’t go into too much detail about the Evol’s frame and the development behind it, since you can find all of that information in our first look article here. 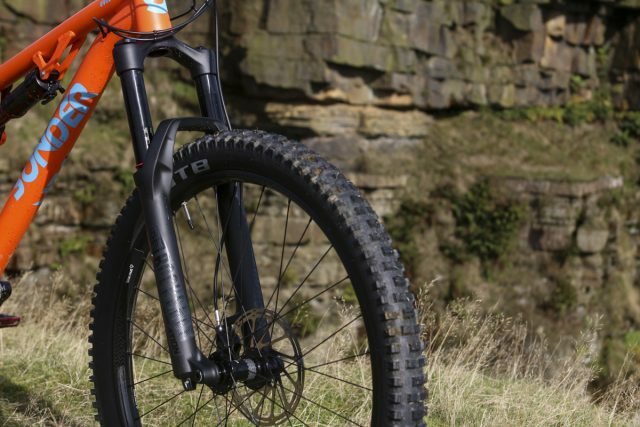 If you’re too lazy to follow that link, the basics are this; the Evol is constructed from a welded alloy frame, which features a four-bar suspension design with the rear shock mounted underneath the top tube. The suspension design is proven and relatively straightforward, and it offers the ability to fit a water bottle inside the mainframe, which is nice. The test bike here is fitted with a RockShox suspension package, with the new Revelation RC on the front, and a Deluxe RT out back. Both units give you adjustable air pressure, adjustable rebound damping, and a compression lever. For the fork, it’s a multi-position lever/dial that allows you to leave the fork open, lock it out, or set it anywhere in between. The shock gives you two positions; open or firm. 150mm travel RockShox Revelation fork on the front is a smooth performer. And the Deluxe RT shock out back is equally as good. Gears, brakes and dropper post also come from SRAM, while the cockpit has been spec’d out with Love Mud components (Sonder’s in-house component brand). Wheelsize is 27.5in, and Sonder has built in enough clearance to fit up to a 2.6in wide tyre. With the stock 2.4in WTB Trail Boss tyre on the back, there is yuuuuuge mud clearance through the Evol’s back end. 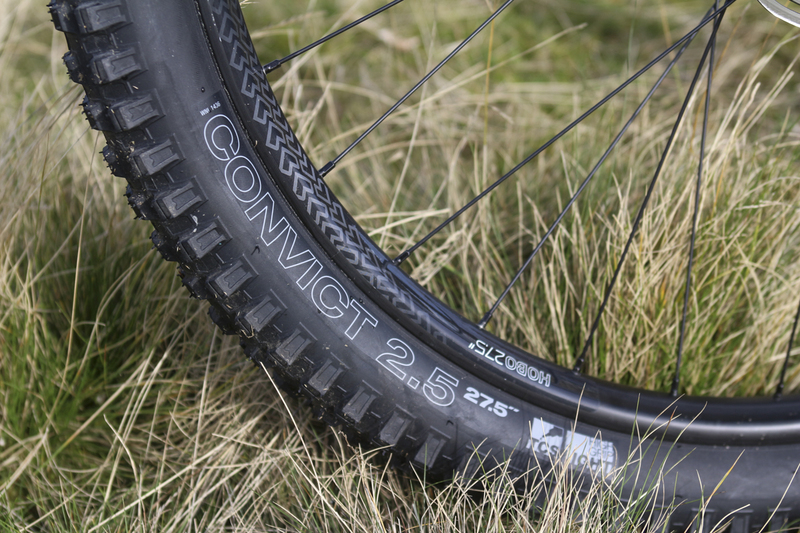 Equipped with many spokes, the Hobo wheelset has a reasonable 29mm inner width, and Boost’d hub spacing front and rear. Our test bike was setup tubeless (a £40 up-charge), with a chunky 2.5in WTB Convict tyre up front and a Trail Boss out back. The Evol is 1x only. Our test bike features the excellent SRAM GX Eagle 12-speed drivetrain. 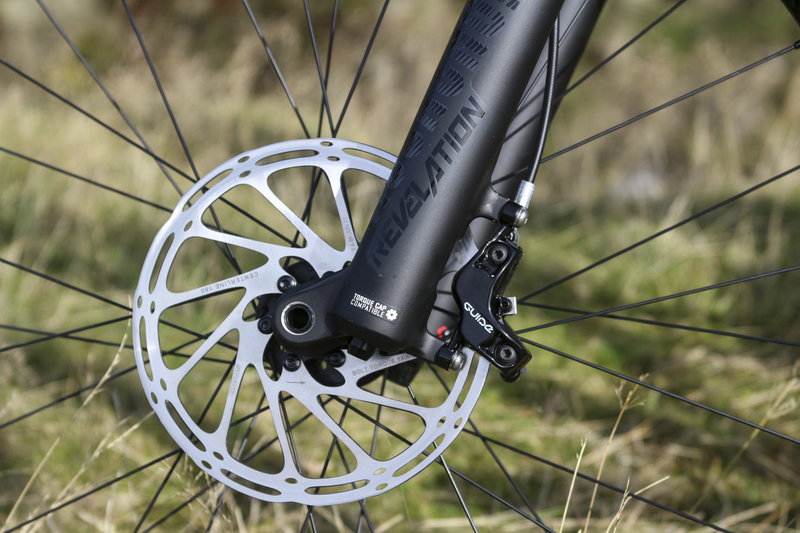 SRAM Guide R brakes with 180mm Centreline rotors. Love Mud Hobo wheels shod with WTB tyres. Geometry on the Evol is contemporary, without being radically long. There’s a 66° head angle, a 74° seat angle, and compact 425mm chainstays. The reach is pretty standard these days (Small: 415mm, Medium: 435mm, Large: 455mm, X-Large: 475mm), and each size is optimised around a 35mm long stem and 780mm wide bars. 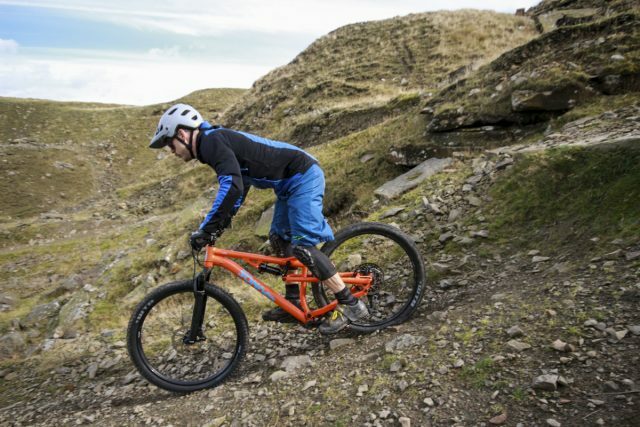 Neil isn’t totally convinced by the current trend to stretch a mountain bike’s wheelbase to tandem-like proportions, and particularly for everyday riders. So the Evol is reasonably long, but not cartoonishly so. 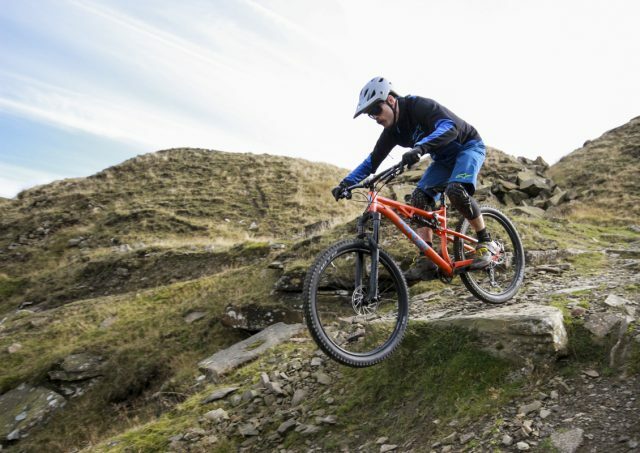 He says that you could certainly race the Evol at an enduro event (the 7lb frame has been built with strength and durability in mind for such riding), but he also wanted to ensure this would be a bike able to be ridden by a wide range of riders with varying skill levels, across a wide range of different trail types. He was also keen to ensure the Evol would be a comfortable bike for climbing, descending, and riding all-day long. In his words, it’s a bike made for weekend warriors, and not just elite-level racers. 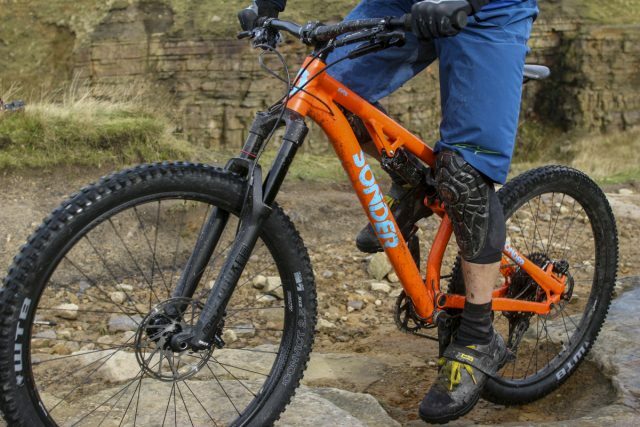 The Sonder Evol is efficient under power, making it a great climber. 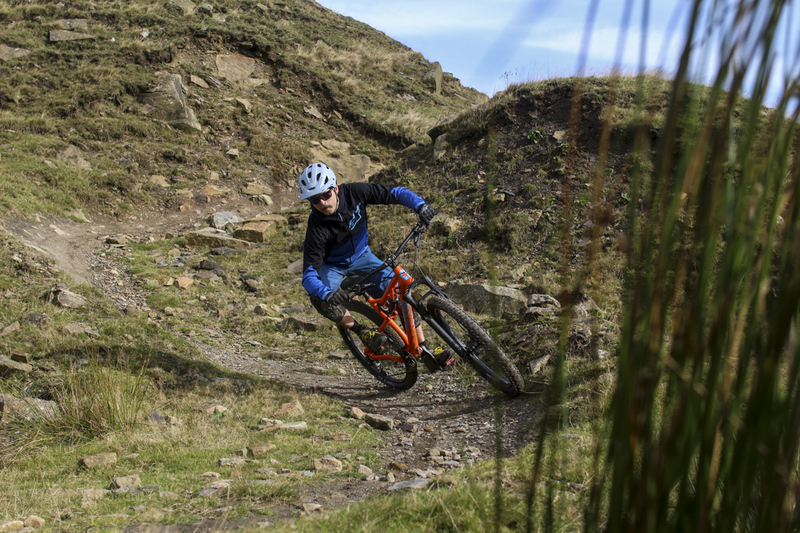 Although our time with the Evol was limited to just a day out, I had the opportunity to put the bike through some of the rocky and technical trails at our local Calderdale trail centre, Lee Quarry. This is a great test bed for bikes, as there are plenty of steep and awkward climbs to tackle, with a combination of flowy undulating descents and steeper, more technical downhill trails that are littered with big slab rock drops and imbedded gritstone. To get the Evol setup, Neil recommended just under 30% sag for the rear shock. For my 70kg riding weight, that put me at about 170psi in the rear shock, and at 72psi for the fork. I set rebound halfway at both ends, adjusted the brake lever reach, inflated the tyres to 22psi on the front and 25psi on the rear, and away we went. Pegged as a versatile trail bike, Sonder wanted to ensure the Evol would be efficient and comfortable enough for pedalling all day long. Straight off the bat, the Evol feels quick for a chunky trail bike with weighty wheels and the moto-inspired Convict tyre on the front. The rear suspension is stable at sag, and there’s very little shock movement under pedalling inputs. Sensitivity from the rear suspension is good, but given the all-round intentions of this bike, Neil wanted to ensure there was sufficient anti-squat built into the rear suspension design so as to resist wallow and bobbing. And he’s certainly achieved that – the Evol pedals very well, even with the shock left wide open. Position wise it’s highly comfortable, and I’d be more than happy to tackle a 4-5 hour cross country ride aboard the Evol. I didn’t realise the bars were as wide as 780mm until Neil told me, as they feel quite natural in their given position. For my 175cm height the 435mm reach is ideal, and the Evol delivers a comfortable and neutral riding position. As expected, it doesn’t feel outrageously long like some other bikes in this travel bracket, and that makes it feel manageable – you can pick the front wheel up when needed, and it doesn’t require you to pull off any elaborate body english just to get it tucked through a tight corner. Intuitive is a good way to describe the handling. I was surprised at just how good of a climber the Evol is. 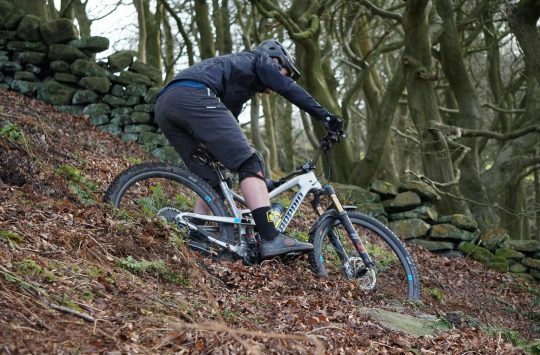 The steep(ish) seat angle keeps your weight fairly central on the bike, and puts you in a good climbing position. The wide bars and short stem do make steering reasonably quick, but somehow I didn’t experience that much wheel lift or wandering even on the steepest climbing pinches around the backside of Lee Quarry. In fact, I had zero issues with climbing at all on the Evol. There’s usable pedal clearance, as the suspension doesn’t seem to wallow into its travel, keeping things steady so you can spin away. I’d probably spec a slightly smaller chainring because I’m more of a spinner than a masher, but otherwise the Evol motored its way up a variety of climbs with little bother. Fun is the name of the game for the Evol though, and it delivers the grin-factor in spades. A snug rear end and a modern cockpit setup ensure fast and agile handling through the turns. The pert suspension behaviour bleeds through to the Evol’s handling, where it provides an enthusiastic and playful feel. The short 430mm chainstay length no doubt helps, giving the Evol plenty of spring for zipping in and out of alternating turns. I’m sure you could get an even more sprightly feel by spec’ing a lighter set of wheels, but I was otherwise surprised at how flickable the Evol was for a 30lb bike. I wouldn’t call the Evol a plough bike, but it is stable and steady. Boosh! Making use of all 140 millimetres of travel. Once we began to hit the more technical descending lines, I started pushing the rear suspension a little harder. On a series of rock drops, I’d found at the end that I’d bottomed out the shock completely, with the red O-ring hanging off the end of the stanchion. Despite bottoming out (and clearly I had in the above photo! ), I didn’t actually feel it through the frame – there’s a nice steady and bottomless feel to that last portion of the travel, and the stout alloy frame remains steady even when loaded up. However, I still bumped up the pressure to 180psi in the rear shock, which proved to be about bang-on. Overall, the suspension performs great, with a “I’m doing my job and you don’t need to worry about it” vibe. It just gets on with things while you ride. Internally, the Metric-sized Deluxe RT shock features a Medium compression and rebound tune, with Neil having elected to stick to a more neutral feel for the Evol chassis. Although I wasn’t able to confirm at the time, I’m told the rear shock comes with 2/3 Bottomless Tokens fitted inside its air can from the factory, so there’s scope to increase progression by adding a third spacer if need be. We’re hoping to get our hands on an Evol soon for a longterm test, and I’ll be keen to play around with setup further. Early signs with the Sonder Evol are very promising indeed. Although I haven’t spent a lot of time aboard the new Evol, the time I have ridden it has left me impressed by Sonder’s first attempt at a full suspension bike. The numbers on the bike sit well in the current market, the frame is well featured, and the spec is very much on-trend. 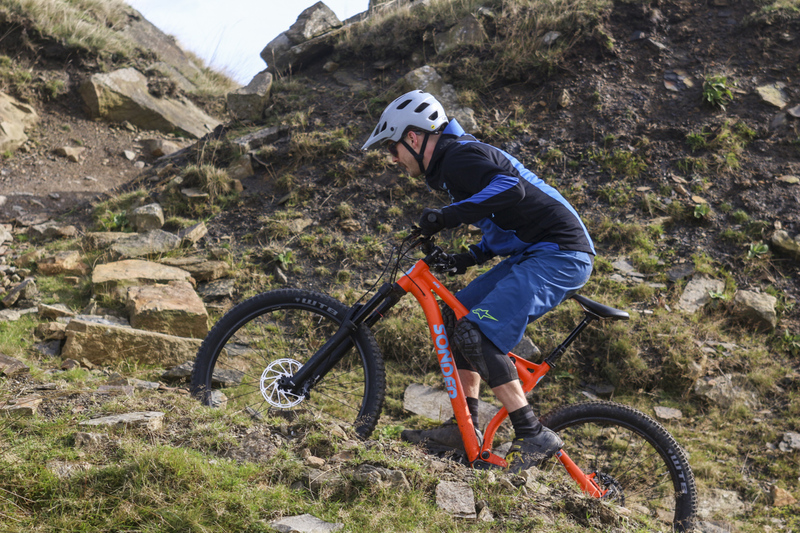 And with its tough alloy frame and neutral rear suspension design, the Evol delivers intuitive handling that makes it just as capable ascending as it is descending. Most importantly for a non-race oriented bike though, it just feels sprightly and fun to ride. 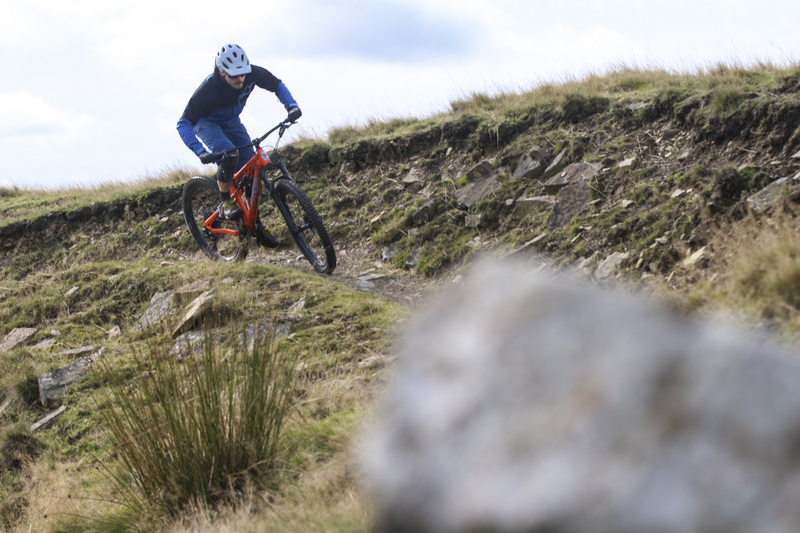 Stay tuned for a more detailed longterm ride report once we get an Evol in for further testing. 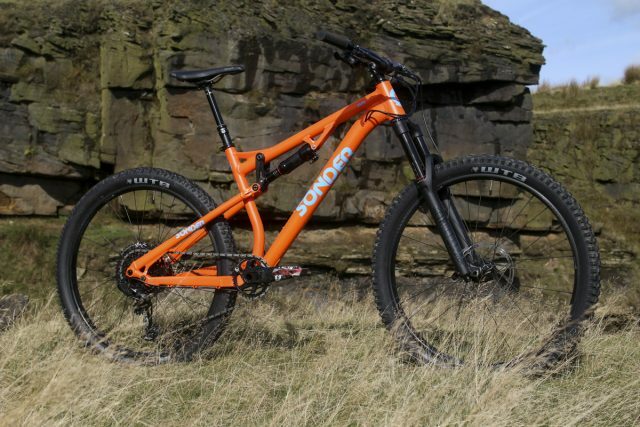 Sonder will be adding the Evol to its website in the next 4-6 weeks, with frames and complete bikes expected to be available by the end of November 2017. @timmys – thanks for checking out the article! Is ‘Body English’ a term you’re unfamiliar with? Or does the sad face mean it’s a term you don’t like? I don’t like it, but then I’m a miserable old bugger. I’m also pretty sure I once saw a photo of it listed on a Singletrack office whiteboard as a banned phrase! @singletrackwil body English is an American term for body language. Does that mean only bodies that speak English can ride it? I’ve been known to spontaneously burst into French when riding out of my ‘comfort zone’.